While reviewing your business object, you can perform hierarchical analysis using an embedded report. For example, while reviewing your account, you can view all the opportunities for subsidiary accounts in a hierarchical table. This gives you a clear view of the overall business this account is generating. We have enhanced Upload/Download feature to make go-lives easier. Earlier you could upload and download only one object at a time. Now, you can upload and download multiple objects. Use Add button to add multiple objects. All these objects will get added to one file which can be uploaded to target system. Dashboard and KPI names are now available for translation in the Language Adaptation Tool. Go to the Language Adaptations tool and create or edit a language adaptation. Under Text Pool Selection, select Get Analytical Report Texts and then select the Business Analytics work center. 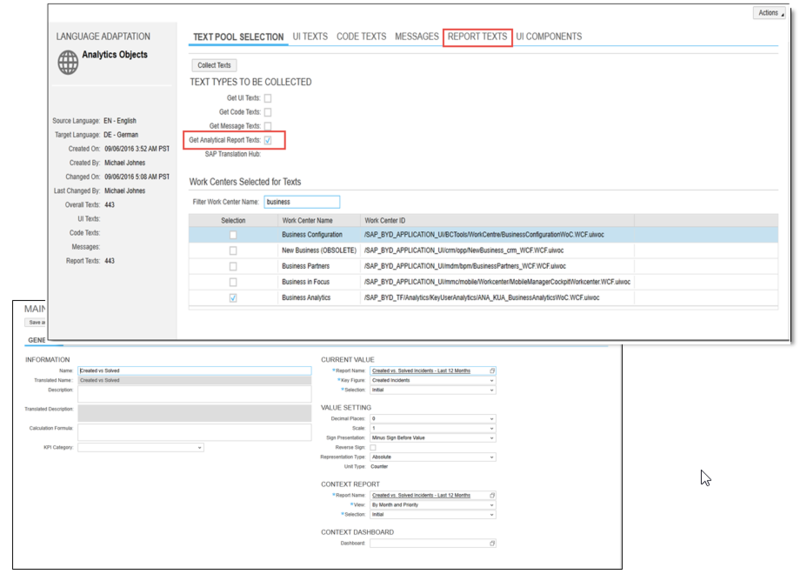 Define Translated text in the Target Text field under the Report Texts tab. SAP Hybris Cloud for Customer now integrates with SAP BusinessObjects Cloud. The integration is available using Analytical ODATA as well as C4C ODATA service. 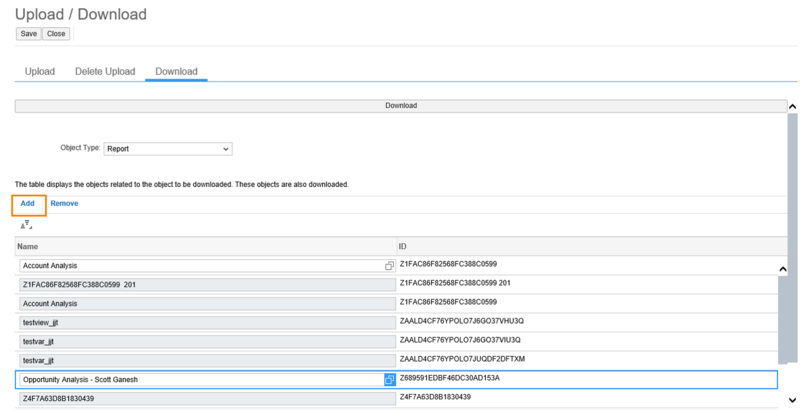 Analytics ODATA allows you to directly access C4C report in BO Cloud. You can leverage all the enhancements done in C4C reports like extension fields, Calculated or restricted key figure in BO Cloud. The reports with fixed or mandatory selections will not be available for integration. At the moment for a given connection report list gets refreshed every one week. This will come along with your system upgrade. I created a connection betwen BOC and C4C. BOC system ask me to create table from a query. However, the information I need comes from several queries. Is there any way to create a personalized query (containing all the fields I need) in C4C that can be used in BOC? Yes, you can create a custom query in C4C and then use that in BO Cloud.